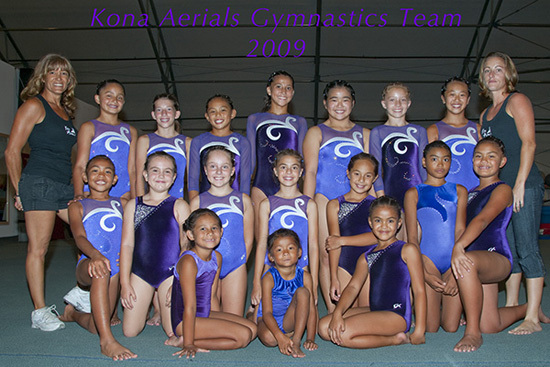 Kona Aerials Gymnastics Team hosted its first compulsory meet of the season Saturday, Sept. 26. The competition included athletes from Pantheon Gymnastics in Hilo, Pacific Gymnastics Hilo, What’s Up Gymnastics from Oahu and the host team Kona Aerials Gymnastics. Kona Aerials gymnasts Hadley Beach and Tianna Morimoto, both Level 6 gymnastics lead the way. Beach won first place for beam and floor, and added second place on vault and bars giving her a first place all around finish with 35.425 . Morimoto won first on both vault and bars and second on beam and floor giving her a second place all around finish with 35.1. Level 6 Reiko Ikeno placed a strong third on beam. This was the first competition for the Level 4 girls and they performed spectacularly with Ileana Hinchcliff taking a first on bars and floor and a first place all-around. Maya Racine received a 9.3 on vault for a second place finish. Myra Liufau had a third place finish on floor. Tatelyn Spencer had an 8.8 on beam for third place. In the 6-year-old age group Aulike Kaiwe took first on vault, second on floor and beam and third on bars for a thirrd place all-around. Also in the 6 year old age group Zine Hassfurther took 3rd on both Beam & Floor. Kona Aerials Gymnastics is located at 74-550 Honokohau Street, Kailua Kona – in the big white tent above the harbor and have tumbling, trampoline, gymnastics and fitness classes for all ages. For further information, call 329-4313.